The handle/wheel assembly, known as the cart or trolley, is often a permanent fixture on a roller. We’re also seeing cases designed to accept an optional removable trolley (fitted to a product line, model series, or specific case, although the trolley may have broader use). Either way, the handle should telescope to a comfortable height, click-locking in position, with wheels that ride equally well on the street as on carpeting. A downside to the fixed trolley: it may eat into the storage space available to camera gear. That means you’ll either need a larger case than you would use ordinarily or end up carrying less. Or you might have to add yet another bag to hold the extras. The benefit to the optional trolley: you can separate the pieces for easier stowage on a plane. But also consider this: some bags (for cameras, laptops, or general-purpose) feature a back panel that lets you slide the bag over the cart handle and rest it on the larger case. Now you have fewer pieces to deal with individually, since everything is all in one place, an especially inviting thought when you reach the airport. I’ll be covering three types of rollers: hard-shell, soft-sided, and convertible backpack. For more specs and optional colors, etc., check the manufacturer website resource list at the end of this article. Most companies offer a variety of rollers. As with carry-on luggage, we have space only for one design/model/size per manufacturer on this flight. 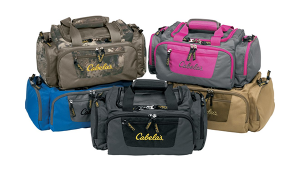 Additional models, sizes (carry-on or larger), and colors may be available. Check the company websites for more options and offerings. Note that hard cases may offer additional interior options other than shown here. These cases are made of molded resin/ABS plastic (or other plastic-like materials) or aluminum/alloy, with latches for closure (with provision for added locks; locks may be included). There is often a seal against dust and moisture. These cases by and large offer the best protection, and, if absolutely necessary, should weather baggage handling. Smaller cases may add a shoulder strap (not a comfy way to travel). Hard cases are not well suited for squeezing into tight spaces, but you can’t overfill them either. These cases are normally not equipped with exterior pockets or a tripod caddy. Depending on manufacturer and case design, hard-sided photo luggage offers interiors that are either foam-filled or modular (via movable padded dividers). The foam may be a solid block shaped around specific gear (usually you have to do the cutting yourself) or it consists of diced foam that you pluck out. The foam may be spongy (open cell) or more rigid (high density). entering the case while preventing vacuum-lock and easing access at any altitude; 22x13.8x9” (domestic and international carry-on,but could be a tight squeeze); 13.6 lbs. Plasticase Nanuk 935 ($369). Waterproof, high-impact molded resin exterior with diced foam interior; telescoping handle with soft-roll wheels with stainless steel bearings; two locking latches with integrated TSA key lock; removable top; stainless steel padlock hole reinforcement inserts; 22x14x9” (domestic and international carry-on, but could be a tight squeeze); 10.8 lbs. Seahorse SE920 ($279). Molded resin exterior; watertight, airtight, dustproof, and crush-resistant; modular padded interior; telescoping handle with metal-bearing wheels; automatic pressure purge system; molded-in padlock holes for optional lock; 24x16x10.1” (not carry-on compatible based on known standards); 14.2 lbs. SKB Cases 3I-2011-7B-D Mil-Std Waterproof Case 7 ($161). Impact-resistant polypropylene resin exterior; water-/dustproof and submersible; resistant to UV, solvents, corrosion, fungus; modular padded interior; telescoping handle with recessed in-line skate wheels; automatic pressure equalization valve; 22.2x14.7x9.5” (domestic and international carry-on, but may be a tight squeeze); 11.8 lbs. These bags are constructed of a pliable material (usually nylon or polyester), but with fairly rigid walls (not necessarily to baggage handling standards). They primarily close with zippers and can’t be secured as well as a hard case. 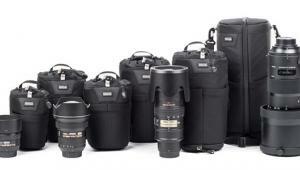 However, they are generally more adaptable than a hard case when squeezing into tight storage spaces and ordinarily have exterior pockets and tripod straps/caddy, adding to their overall utility. Soft luggage is not as resistant to dust, moisture, and especially driving rains as a hard case, which is where a rainfly comes in handy (if provided). 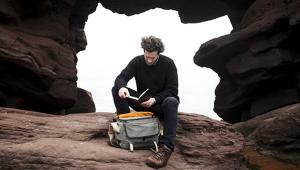 As a rule, the interior is customizable, with padded dividers, and often pockets inside the lid. Provision is often made for a laptop outside or inside the bag. Modular interiors routinely feature a camera caddy (meaning dividers arranged to support the camera with lens attached) top or bottom, or both, so you can have a D-SLR, or two, at the ready. Modular interiors are especially handy for when you need to reconfigure the layout on the fly, such as when changing from a short to a long lens, and then have to pack up without changing back. Where the trolley is optional, we’ve priced such cases, including the optional accessory. Domke Rolling Propack 217 ($199). Nylon exterior with modular padded interior with capacity for D-SLR and numerous lenses/flash; spacious pockets; telescoping handle with in-line skate wheels; 14x10x17.5”; expands additional 2.5” (domestic and international carry-on); 10.3 lbs. Jill-e Designs Rolling Red Leather Gear Bag ($299). Fashion-oriented; top grade, weather-resistant leather; modular padded interior holds two D-SLRs plus extra lens; telescoping handle and heavy-duty rollers; 17” laptop sleeve; matching pouch to hold personal items plus additional pockets; 20x9x15” (domestic and international carry-on); 8.3 lbs. Kata Pro-Light FlyBy-75 ($239). Ripstop nylon exterior; modular padded interior; telescoping handle and wheels; holds one to two D-SLR bodies with six to eight lenses (up to 400mm), flash, and more; 15.4” laptop sleeve; external pocket for travel documents; tripod straps; 14.8x9.4x18.7” (domestic and international carry-on); 7 lbs. Lightware MultiFormat 2012 with optional MultiMate 2012 ($478). Ballistic nylon exterior with modular padded interior; holds a D-SLR with a range of optics, including 300mm f/4 lens, plus flash and accessories; 12” laptop sleeve; additional pockets in lid; bag fits into optional MultiMate trolley tray without adding to overall size; 21x14x8.5” (domestic and international carry-on); 7 lbs. M-Rock 5080 Everglades with optional Modular Cart 7080 ($167). Nylon exterior with dual access via top and front; modular padded interior holds D-SLR with lens to 8.5”; additional lenses/flash; 13” laptop sleeve; additional pockets; rainfly; 12x10x9.5” (domestic and international carry-on); 6.5 lbs with cart (2 lbs w/o cart). Manfrotto Lino Pro VII Roller MB LR050-7BB ($604). Nylon exterior with leather trim; modular padded interior with capacity for two camera bodies (w/o lens attached), several lenses/flashes, plus accessories in various pockets; 17” laptop sleeve; telescoping handle with wheels; tripod caddy; tuck-away rainfly; 21.3x14.6x9.5” (domestic and international carry-on, but could be a tight squeeze); 11.1 lbs. 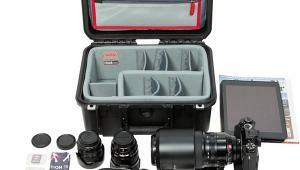 OmegaBrandess Todd Gustafson Photo Safari Rolling Case PCS383CB by Pelican ($319). Polyester/canvas exterior with leather trim; modular padded interior; removable 17” laptop shoulder bag; accessories pocket; tripod straps; telescoping handle with in-line skate wheels; rainfly; detachable computer bag; main case: 21x14.5x8” (domestic and international carry-on); 13.5 lbs. 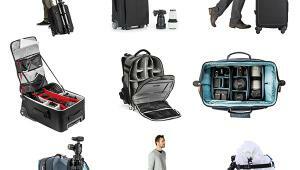 ThinkTank Airport International V 2.0 Rolling Camera Bag ($369). Ballistic nylon exterior; telescoping handle with in-line skate wheels; TSA lock and security tether; holds up to two D-SLRs with lens, plus multiple lenses to 300mm f/2.8 and flash; outside pocket for optional 17” laptop pouch; tripod caddy; organizer pockets; 14x21x8” (domestic and international carry-on); 9.5 lbs. Vanguard Xcenior 48T ($299). 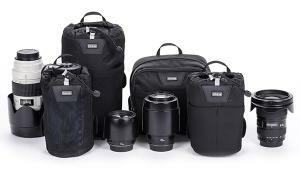 Polyester exterior with removable, modular padded interior; 14” laptop sleeve; accessories pockets; tripod caddy; telescoping handle with oversized wheels; holds D-SLR with lens; additional lenses to 300mm f/2.8 and flash; 15x11 3/8x19 1/8” (domestic and international carry-on, but could be a tight squeeze); 9.4 lbs. Sometimes your back needs a break from that backpack—but you still want the carrying options. And that’s where a backpack roller enters the picture. 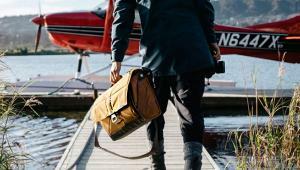 The downside is that the straps add to a bag’s bulk or they infringe on the space available for camera gear. 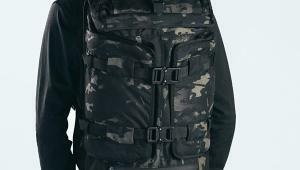 What’s more, the backpack may lack a waist belt and/or chest strap, reducing its effectiveness on long outings. 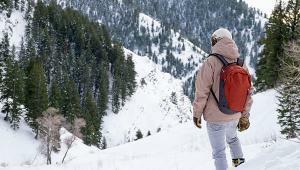 Add to that, the cart makes this type of pack heavier and less ergonomic (even with a full complement of straps) than a conventional backpack. Still, that hasn’t stopped me from using one when I needed to climb stairs or when I wanted to avoid leaving the bag unattended, even a few steps away, while I was taking pictures on a busy thoroughfare. Nylon exterior with modular padded interior with capacity for D-SLR, lenses, shoe-mounts; 17” laptop sleeve; accessories pockets; removable trolley with in-line skate wheels and telescoping handle; fully adjustable harness system, includes padded waist belt and chest strap; tripod caddy; tuck-away rainfly; 15.4x19.25x10.1” (domestic and international carry-on); 9.4 lbs. 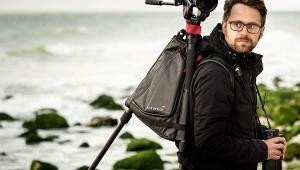 Lowepro Pro Roller x200 ($349). Removable ballistic nylon photo backpack with customizable padded interior; trolley attached to exterior ballistic nylon shell; TSA-approved lock; retractable TelePod Handle serves as camera/shoe-mount support; holds one to two D-SLRs plus six to eight lenses; 15” laptop sleeve; accessories pockets; tripod caddy; 15.7x11.2x24.2” (interior backpack is domestic and international carry-on friendly); 13.2 lbs. Naneu Urban Gear U220n ($299). Ballistic nylon exterior with removable modular padded camera insert with three quick-access points; holds D-SLR with 300mm f/2.8 lens attached, plus four to six additional lenses/flashes; 17” removable laptop sleeve; additional pockets; rainfly; tuck-away harness/waist belt; 20x13.75x10.5” (domestic and international carry-on); 10.9 lbs. Tamrac Model 5797 Evolution Speed Roller Backpack ($379). Dual-tier design with fabric exterior and modular padded interior; upper tier holds D-SLR with lens/extra lens/flash or personal items with dividers removed; bottom tier holds D-SLR with 70-200mm f/2.8 lens plus other lenses/flash; 15.6” laptop sleeve; accessory pockets; tripod caddy; telescoping handle with ball-bearing wheels; tuck-away harness with chest strap; rainfly; 14x9x21 (domestic and international carry-on); 7 lbs. 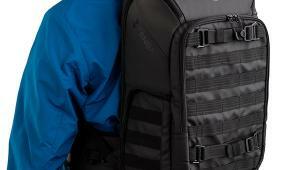 Tenba Roadie II Universal Hybrid Roller/Backpack ($324). Ballistic nylon exterior with modular padded interior; holds one to two D-SLRs, six to eight lenses (to 400mm f/2.8), and flash; 17” laptop sleeve; backpack harness with chest strap; telescoping handle with ball-bearing wheels; tripod caddy; document pocket, plus accessories pockets and media wallet; 14x20x8.5” (domestic and international carry-on); 10.5 lbs. Airline carry-on guidelines vary with carrier, airport, country—and the aircraft on each leg of your journey. While 45” (overall dimensions) is normally accepted for domestic carry-on, international carry-on generally ranges from 42” to 45”. And manufacturers lean toward the higher number when recommending their cases, so 45” is what I’m using to base my assessment as carry-on compatible. That said, manufacturers might be even more liberal in their recommendations. (In truth, you should be more cognizant of actual dimensions: length x width x depth.) Always verify carry-on baggage allowances before leaving home, and keep in mind that smaller connector flights might not allow for roller bags that easily fit on the larger feeders; these will likely be stowed as you board. And be especially cognizant of overseas requirements. Also, with soft-sided bags, keep in mind that attaching a tripod or removable trolley, or overfilling the bag, may bulk the case out enough to disqualify it as carry-on baggage. Weight can even be an overriding factor, forcing suitably sized luggage to be stowed as baggage on selected international flights and commuter/charter flights. And to be safe, carry one or two spare TSA-approved locks. There’s always the possibility of not finding a space in the overhead and having to turn the case over to a flight attendant for stowage. All photos courtesy of the respective manufacturer/distributor. 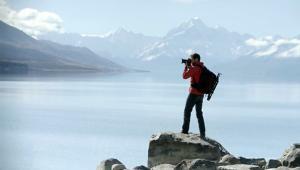 These bags are really ideal for those work entails traveling specially when you are also fun with photography. Wow! Looking sounds good. Especially Tamrac Model 5797 Evolution Speed Roller Backpack, nice one. I read out its details. Prices are also really good. Sure will must be got it in future as soon as possible. That is a really great list of travel cases. I've personally always preferred to travel with a hard case since I know that if I have to check my gear (if the place is to small or for what ever reason they airline gives you) I'm sure the content will be protected from tough handling. I personally own the ThinkTank Airport International V 2.0 and I love this case when I'm just going around town to a client shoot. It's got a lot of pockets and good quality wheels and handle. I also own a lot of Nanuk cases and the 935 is definitely one of my favorites. It's been traveling with me for a while now and I use it for my Canon lens and bodies. I also use the 945 for my light equipment (Elinchrom portable Quadras) and I've never had a bulb break even when I checked the cases (the 945 needs to be checked and the 935 you can bring on the plane with you). I've been so impressed with the Nanuk that I started offering them to professionals through an online store at HardCases.ca. Great, trustable cases made in Canada.